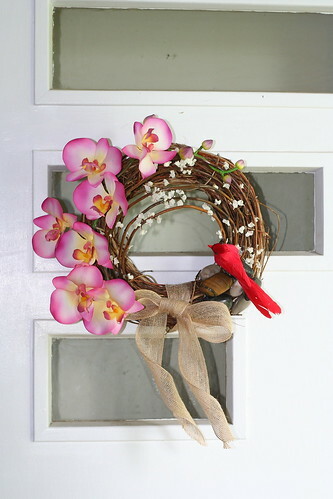 I wanted more "Asian look" to the wreath and I thought that the river stones were a nice addition. And of course I always loved Cardinal birds :-) I hope you like it! I just adore lilac! 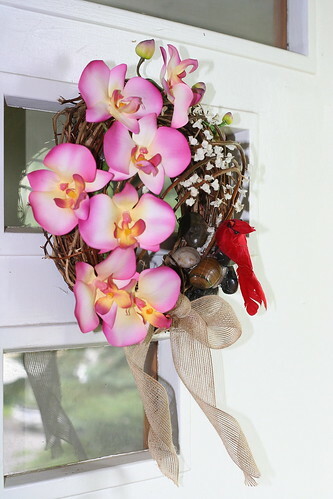 One of the flowers I can keep in my home year round without getting bored by the scent! Unfortunately they don't last as long and for some reason I can't seem to be able to grow any in our backyard. 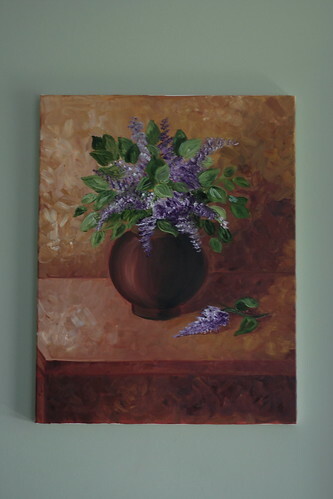 A friend of mine gave me some of hers and wanted to "preserve" it somehow, so I decided to paint lilacs as my second painting. I am not very pleased by the way it turned out. I think I need to take some classes or something. I haven't even read a single book on oil painting and am going just by the huntch how it is supposed to be done. But I am getting restless. I need more...And of course I can't afford to spend a fortune on MFA or MA, but I am thinking very much about it and am sure I'll figure out something. Do you like it? I love this painting! I couldn't wait to hang it on the wall but when I did, my mom reminded me of something I either didn't know at the time, or completely forgot about- in Feng Shui, a white Koi fish with a red dot on the forehead represents bankruptcy. Bummer! At first I decided to leave it like that, but since all the other "energizing" pictures I hanged worked so surprisingly well, I thought that I can't take the chance. So what I did was, I painted a dark, almost black color on top of the red dot. I wasn't very fond of the idea of tampering with the original picture, but I kind of like it how it turned out. I even found the perfect spot for it in our living room, next to the front door. 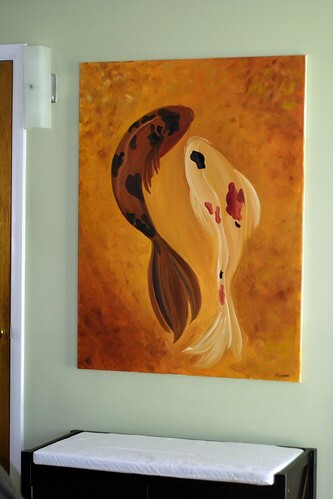 Couple of people asked me, why 2 fish only, since koi fish are painted usually either by 3, 6 or 9? I wanted them to represent the Yin and Yang as well, so I decided to make 2. Couple of people asked me if I would sell the painting. I don't know, I've never sold any paintings, in fact this is the first one I've painted with oil paint. But I feel funny about giving it away to somebody, not like with my cakes that I gladly share with other people and don't mind cutting. On the other hand I have no idea how much would one as big as this one cost. But I am curious to know how much people would pay for one like this one. Any suggestions?